Here's where to watch every episode of The Amanda Show season 2. Mouseover or tap an episode to see where to stream it. Click or tap the play icon to stream it on the best available service. Episode 15 Jul 29, 2000 Penelope get's in Amanda's dressing room through the air conditioning vent and finds a sandwitch in it! The Amanda Shows electricity supply go's out because Nancy and Drake are cooking weenies. Then there's ""Pass The Skun"" game, where, if the music stops, the skun pee's in your face. There's a game of ""So You Wanna Win Five Dollars?"" with Tony Pajamas and Judge Trudy as the contestants. Also, In Moody's Point, Moody returns a tape one minute late and finds it hard to tell her dad about it. Then Moody's friend doesn't make the cheerleading team due to her terrible audition. And, the electricity go's out once again because the dancing lobsters make Drake fly in the air, using their hairdriers. Episode 16 Aug 12, 2000 Today, Amanda has a cold. Penelope turns up and starts stealing Amanda's germs, but gets caught by security! Meanwhile, Amanda helps an audience member find their lost paper clip. It's so fascinating we have to go to a commercial for the always-popular ""Allowance Doubler"" - then it's back to the show, and the members of The Girls Room are trying out for new members. Plus, Amanda holds a talk show from her jacuzzi, gets a visit from Tony Pajamas the babysitter, tells some knock knock jokes in another Hillbilly Moment, Kyle has a shower moment, there's a small problem with the telephone, and more suggestions from the audience about how to cure Amanda's cold. Episode 17 Aug 26, 2000 It's The Drake Show! Well, for a little while anyway, until Amanda shows up, but finds that a vital guest star is missing! We pay a visit to the Klutz restaurant, Amanda interviews Frankenstein, and Ennis and Lula Mae reach out and hit somebody in an Outdoors Hillbilly Moment. Penelope has a fight for the title of Amanda's number one fan, please, then there's just time for a lesson from Mr. Gullible before the show comes to a complete stop once more. Episode 18 Sep 9, 2000 Penelope's quest to find Amanda finds her turning up in somebody's toilet, which is almost as smelly as our first commercial for a game that everyone will enjoy - Pass The Skunk! Then it's back to the show, and Judge Trudy is a contestant on another edition of So You Wanna Win $5. There's just time for a visit to Moody's Point before we have to close the show once more, and Amanda discovers why the lights keep going out. Episode 19 Sep 23, 2000 Penelope takes out the security guard with some apples today, while Amanda goes looking for people whose dreams need to come true. We take in a quick commercial for the Spitballer 5000, then it's back for the homemade adventures of Blockblister video. All this, and Crime Fighting Cheerleaders, another Hillbilly Moment, a visit to the Wedding Singers.. and 398 pretzels! Episode 20 Oct 7, 2000 Drake starts the show with an attempt on the turkey balancing record, while Amanda has some presidential guest stars. After the fight breaks out, it's time to go to another gross commercial, but we're back in time to pay another visit to the Girl's Room. Crazy Courtney is back, and today she's getting a lesson in how to play the piano, while Amanda interviews Santa Claus in the jacuzzi before closing the show with a jitterbugging dance lesson. Episode 21 Oct 21, 2000 Today there's a surprise - and a free sandwich - in store for one lucky audience member, while Amanda's show opening is interrupted by a pizza delivery guy. Better go to a commercial - and what better than the awesome new game, ""My Beautiful Big Toe"" ? But don't stay away too long, because Judge Trudy has two itchy cases to pass judgement on. There's another visit to Moody's Point, and Mr Oldman gets some more unwelcome phone calls. All this, and a bald guy who wants Amanda's autograph as well! Episode 22 Oct 28, 2000 Today Amanda is searching for someone to open Josh's bag of crisps, but there's a painful moment when she feels a little unwell and needs some medical advice. There's a commercial message for the Little Crazy Hatman, and we go shopping at Cookie Dooper. Then, some serious factual documentary programming, Penelope swaps clothes with Barney, and Kyle talks about his cousin in Jersey - until he realises that he has no cousin in Jersey. And finally, Penelope gets to meet Amanda at long last - but is it really Amanda, or just an incredible simulation? 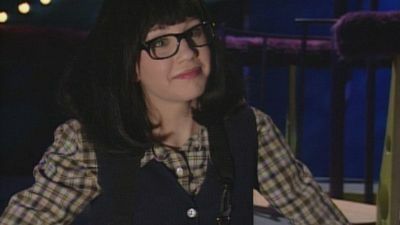 Episode 23 Nov 18, 2000 Penelope tries to get into Amanda's dressing room with a cunning bear disguise today, but Amanda is already on stage, helping a fan whose parents won't let him watch The Amanda Show. There's important commercial news for vegetarians, and more money matters as the glittering prize is still up for grabs in ""So You Wanna Win Five Dollars"". After the entertainment, time for a serious documentary with the Crime Fighting Cheerleaders, more Knock Knock jokes in another Hillbilly Moment, and an excellent sketch that gets totally interrupted by Penelope. Plus, Amanda interviews Elvis in her jacuzzi, and Amanada hands out fifty thousand dollars to a lucky audience member with a birthday. Episode 24 Dec 9, 2000 The Amanda Show gets off to a bad start today when it's opened by the wrong Amanda! After the mistake is sorted out, it's time for a quick word from Mammal-Os, the healthy cereal with a live mammal in every box! Then back to the action with Crazy Courtney, a quick visit to Moody's Point, and Kyle totally tells us about the radio. Plus, Amanda's meat song is interrupted by the sound of a lawnmower - someone's mowing the stage! Episode 25 Dec 23, 2000 Penelope finds an easy entrance to the studios today when she falls in love with Trevor, the security guard's son, but Amanda is already on stage pulling the audience's teeth out. There's more totally genuine video as Blockblister rents the authentic 'Face Venutra' to an unsuspecting customer, and today's guest in Amanda's Jacuzzi is Sitting Bull. Penelope gets closer to Amanda than ever before, but misses her chance because she's too busy kissing Trevor! Episode 26 Jan 27, 2001 Penelope meets a famous Nick star today - not Amanda, but Noah from Noah Knows Best. Meanwhile, Amanda finds that she has somebody else's pager. There's a visit to the Cookie shop, except now it's selling something else, and there's more prime-time entertainment with Amanda's Jacuzzi and another million dollar episode of ""Stranded"". Meanwhile, backstage, Penelope has to tie Noah to a chair to make him look at her website, while Kyle tells us what's on his mind with more ""Totally Kyle"". Then Noah escapes, but gets on stage just as the show is closing! They think it's all over! Episode 27 Feb 17, 2001 Amanda starts the show by giving a big hand to just about everybody but there's no time for that, because today The Girls Room is coming from The Boys Room by mistake! Meanwhile, Amanda is interviewing a Swiss Guy, while Tony Pyjamas and Candy Tulips have another problem. There's another Hillbilly moment where Eenis gets hit over the head with something soft this time, and Penelope is on the set of the show hanging up pictures of Amanda. There's more phone trouble for Mr Oldman, and then the show has a surprise ending when robbers steal the camera! Episode 28 Mar 3, 2001 Penelope thinks she's finally going to speak to Amanda when she's a guest on a phone in show, but the emergency broadcast system interrupts proceedings. Amanda tries to open the show, but is interrupted by dodgeballs, and Judge Trudy enrols on the first day of school, but is interrupted by a problem with oatmeal. There's just time for a quick visit to Moody's Point, before it's time to close the show &#x13; but why is it snowing in the studio? Episode 29 Mar 17, 2001 The world's greatest ventriloquist is coming on the show today, and Penelope senses a chance to get closer to Amanda. Meanwhile, Amanda's show open is interrupted by a man speaking Italian but what is he saying? There's a special report on the danger of When School Mascots Attack, and today Amanda's special guest in the Jacuzzi is Moses. We pay a visit to The Lucklesses, a family who always seem to have the worst luck, plus there's time for a Hillbilly Moment, and Kyle talks about a string breaking on his guitar.